The Prorunner mk1 is a compact and robust discontinuous productlfit that requires minimal maintenance and is attractively priced. The Prorunner mk5 is a continuous vertical conveyor specifically suitable for average to high capacity applications. The Prorunner mk9 is a rugged pallet lift that will lift and lower your pallets, until the end of time. 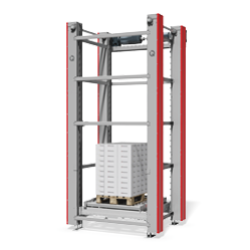 The Prorunner mk10 is the perfect solution for capacities of up to 60 pallets per hour.